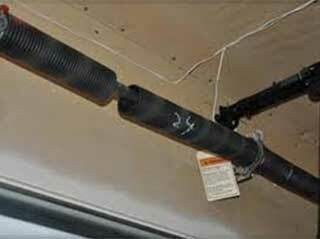 Garage door springs are the most crucial components involved in your system's opening and closing process. They may look harmless, but they can actually be quite dangerous. They are wound extremely tightly and are carefully adjusted upon installation to make sure your door doesn't tilt or gets off balance. They're the type of components you rarely think about, and you may even completely forget about them, until something goes wrong. Due to the nature of their operation and the enormous amounts of tension involved in their day to day use, springs can be extremely dangerous to handle without the proper training. If mishandled in any way, they can cause serious bodily injury to yourself or your family, or damage your property at the very least. This is one of those jobs that any would-be do-it-yourself-ers will likely want to leave alone. For this reason, it is in your best interest that you call our professional technicians for any spring related issue you may be experiencing. It’s hard to remember if your springs need maintenance or replacement. In fact, most people barely give them a second thought. Usually, the first indication that there is something wrong with them, or your door in general, is that the opening and closing process becomes quite noisy. Sometimes a little proper lubrication can do the trick. However, if the issue remains unsolved, you'll need to call in our experts. Is it Just a Balance Problem? If your garage door has been properly installed, opening and closing it should be smooth and effortless. If one side comes down faster than the other than you probably have a problem. It could just mean that your door is out of balance, or it could also mean that it’s time to get your springs either adjusted or replaced. As we mentioned before, trying to handle these types of scenarios by yourself is very risky, and you should leave it to the pros. Call our team at Garage Door Repair Cypress today, and get your springs serviced by the best technicians out there. You can count on our company for the finest garage door repairs, maintenance, service and installations in town. Our knowledgeable technicians give you fast, dependable, same-day service at the most affordable prices in town. Check out this About us page for more information about our company and our services. Thank you for choosing Garage Door Repair Cypress! One of our experts will be in touch soon. Feel free to browse our website for FAQ, tips and more useful information in the meantime!